Blargh. You guys. The carb flu is real. I feel gross, but I’m persevering because I know I’ll feel better. Eventually. Maybe your shiny resolutions this year involve diet and exercise. But we all know that is a long con. You have to stick with it, possibly for weeks or months, before you hit real pay dirt. 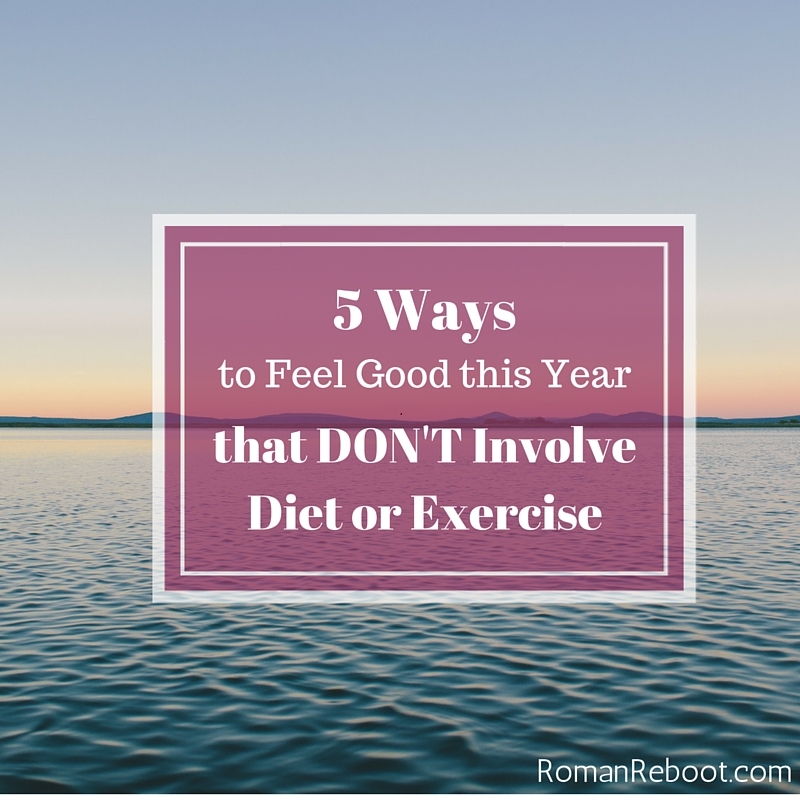 Maybe you have resolutions that have nothing to do with fitness. How un-cliche of you! Get it, gurl. I can’t wait to hear all about the new vegan taco truck you opened for dogs. Or maybe you think resolving to be better at an arbitrary time of the year is for complete suckers. You are living in a higher state of enlightenment and resolve to be your best every day of the year. Good for you. Whatever camp you fall in, I have some thoughts on things you can do for yourself. These are all low effort, low cost, and can help you start the year on the right foot. True to my words, meditation is probably the number one thing I miss that I haven’t kept up from the 30 Day EVERYTHING Challenge. I think this is because it is hard to assign specific benefits to it. I can’t say that my hair is shiny or my weight is down because of it. Could be. But I can’t say. But I do know that it is a free gift to give yourself. Just a few minutes of reflection or prayer can be great to calm your mind in a crazy world. Besides, who am I to argue with Jerry Seinfeld? It makes a huge difference. Palmer’s is still my favorite, even though the pumps never seem to work. I received some Burt’s Bees for Christmas that has really been hitting the spot. Seriously. Just a few minutes can be the difference between a just-fine day and a super-itchy-do-I-have-poison-ivy day. Mouths are people too. (Said no one ever because it really doesn’t make any sense.) But you know what I mean. The New Year is no time to neglect your oral health. Your body could be slamming, but bad breath would still keep all the boys from the yard. Or girls from the . . . whatever, you know what I mean. I also got my floss on during the 30 Day EVERYTHING Challenge. It is a little embarrassing though to admit to needing a challenge to do something you’re supposed to be doing anyway. Don’t be like me. Floss. Feel better! Did I ever tell you that I’ve bit my nails as long as I can remember? (It makes floss neglect seem much less embarrassing.) I’ve stopped for a few times–such as showing off an engagement ring–but it always seems to come back. Not too long ago, I found myself admiring a friend’s manicure. This is how I heard about Jamberry. They are stickers that you heat up before applying for a clean, lasting manicure. Pretty, I thought, but I’ll never do it. Then I toyed around with a free sample on one of my nails. It wasn’t super hard to apply, but it was more work than what I currently do (nothing). I was critical of the nail. I stared at the gaps on the sides. I was not instantly in love. But then I couldn’t stop staring at it for the next week. It looked so pretty, so polished. It made me want nice nails. Jamberry just seems like a cool idea. Another friend mentions that she uses them for her daughter who does bite her nails. This way she has the reminder not to bite, but she isn’t ingesting any chemicals from fingernail polish if she takes a nibble. If only I’d had such an option . . .
Wow, so that all totally reads like a giant advertisement. My sister says I am behind the times and people are having Jamberry parties everywhere. If you are interested, this is my friend’s referral page. Curious about your experience if you’ve tried them! Maybe this isn’t you. Maybe your facial regime is beyond reproach. But, if you are at all like me, this could be an area for a tune up. Washing my face makes me 575% more likely to put on a moisturizing cream and maybe even use a little toner before. And when I do, I can definitely feel a difference. Just a few cheap tweaks that can help you feel great. Are you trying anything new this year? What’s your favorite lotion? Have you jumped on the Jamberry craze? P.S. If your resolution DOES involve diet and exercise, it isn’t too late to join the Diet Bet! No Jamberry craze for me right now, but I have recently discovered 100% Fractionated Coconut Oil ( available on Amazon ). All you do is quickly put it on after your shower ( before you towel off ) and you will feel instant results. It doesn’t leave any oily or sticky residue and has no coconut smell at all. It’s also good for hair, nails and cuticles and I SWEAR it helps to heal because I burned my arm the day of the Xmas party at the Ambassodor’s and it was completely healed and almost invisible by New Years. Ooo – will have to try. Thanks!